Much of the information on this page is tentative, and subject to change. For more (and more current) information, visit the course's Blackboard page. This course is a sequel to Mathematics 8 and provides an introduction to calculus of vector-valued functions. Topics include differentiation and integration of parametrically defined functions with interpretations of velocity, acceleration, arclength and curvature. Other topics include iterated, double, triple and surface integrals including change of coordinates. The remainder of the course is devoted to vector fields, line integrals, Green’s theorem, curl and divergence, and Stokes’ theorem. 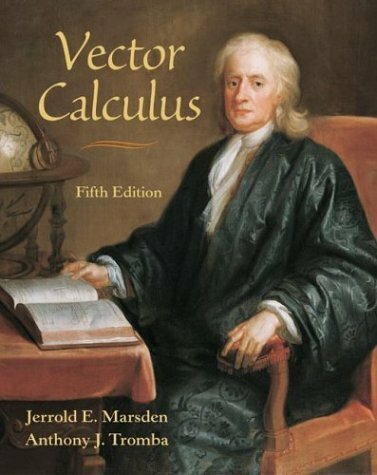 Vector Calculus, 5th ed., by Jerrold Marsden and Anthony Tromba. The x-hour will be used as needed to keep pace with the syllabus and text material. Please keep this time available. Check your course section's Blackboard page for details. Homework will be assigned weekly, and will be due each Friday at the beginning of class. New assignments will be posted on the course's Blackboard page on Fridays after class. Late homework will NOT be accepted. Write your name on each assignment. This probably sounds obvious, but is sometimes easy to forget. Label the problems. Each problem should be numbered, and its page number indicated. Also, make sure your handwriting is legible; if the graders can't read your solution, they can't give you credit. Make sure to show all work for each problem, whether you complete it or not. Don't be afraid to use a little extra space to write out each problem; if necessary, use a whole page for a difficult exercise. If you have a question about the homework, feel free to e-mail your tutors or myself, come in to see me during office hours, or make an appointment. Also note: Though class participation is not directly a part of the grading for this course, be aware that good attendance and participation will make it easier for your instructors to make end-of-term grading decisions. For example, if your final grade is a high B, good participation and attendance may bump you up to a B+. There will be two midterm exams and one final exam. On Exams and Quizzes: No help given or received. On Homework: Working together is permitted and encouraged, but NO COPYING. You are welcome to work in groups to discuss the ideas and specific problems (also feel free to discuss with your instructor, tutors, and anyone else you may find). However, each student is expected to produce the final written homework set individually and independently. Students with special needs who will be taking this course and may need disability-related classroom accommodations are encouraged to make an appointment to see their instructor as soon as possible, certainly within the first two weeks of the course. Also, they should stop by the Academic Skills Center in Collis Center to register for support services.